SafeDisc DRM[Note 1]. See version differences for more info. 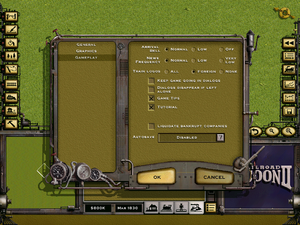 Railroad Tycoon II: Gold Edition includes the base game, its expansion, 15 additional official scenarios, and exclusive HMTL-based strategy guides for all included scenarios and campaigns. 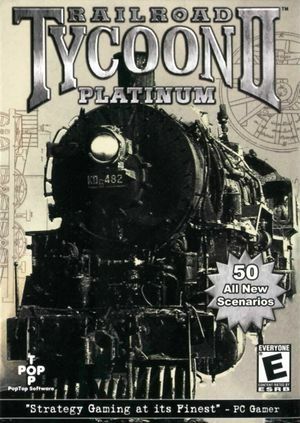 Railroad Tycoon II: Platinum includes the Gold Edition's non-exclusive content as well as 50 additional levels, the official strategy guide for the base game in PDF format, and 2 hours of additional music. 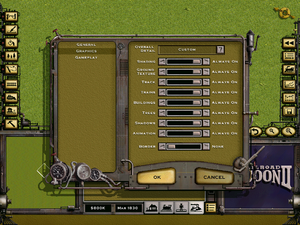 Railroad Tycoon II: Platinum is Windows-only, whereas all previous versions of the game were also released separately for Mac OS and Linux. All patches available for the game can be found here. 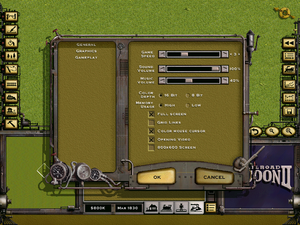 Set compatibility mode to "Windows XP Service Pack 3" and color mode to 16-bit. ↑ 2.0 2.1 File/folder structure within this directory reflects the path(s) listed for Windows and/or Steam game data (use Wine regedit to access Windows registry paths). Games with Steam Cloud support may store data in ~/.steam/steam/userdata/<user-id>/7620/ in addition to or instead of this directory. The app ID (7620) may differ in some cases. Treat backslashes as forward slashes. See the glossary page for details. This page was last edited on 9 April 2019, at 08:36.